learn more / Benefits / F.A.Q. The Cast Protector is a premade device to pad a sports cast. It consists of an inner pad of closed cell foam and an outer polyester and spandex (elastane) cover. It is fastened by 4 velcro straps and is intended for use over a short arm cast or splint in sports requiring padding to play. It was designed by an orthopedic surgeon with 30 years of on-field experience in consultation with certified athletic trainers. The medium and large sizes have half inch padding and meet current high school and college guidelines for playing with and cast or splint. The small size has a 3/8 inch pad and is intended for younger, smaller players at levels below high school. The Cast Protector saves the cost of retaping every day. Simplicity and ease of use define the idea while assuring adequate padding and compliance with rules of play. The time of a Parent, coach or trainer is too valuable to waste making a new pad every day. This pad can be applied by the player if necessary without worry. ***If you have a long arm cast that extends to your upper arm, please contact us with your cast measurements and we will custom build a cast protector for you! The Cast Protector: The only approved pre-made cast pad for sports. It is quick, easy, durable, and meets guidelines to play at the High School and College levels. If you, your child, your player or your friend has broken their arm and is now in a cast, there still may be a way to compete in sports. Once the pain subsides and the doctor feels it is safe, some sports allow individuals to pad the cast and play. 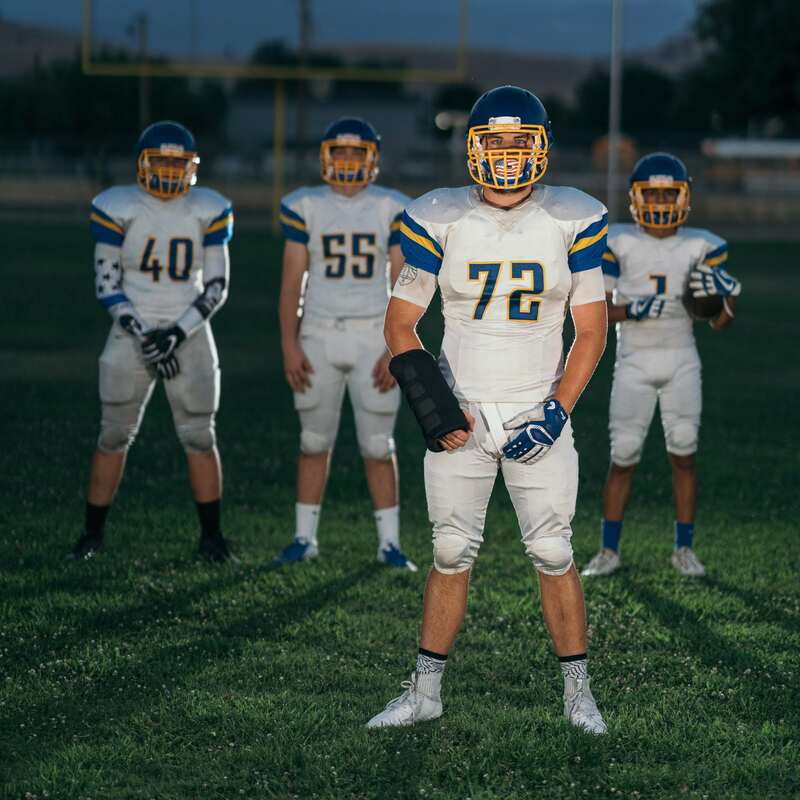 The CAST PROTECTOR satisfies a requirement specified by the National Federation of High School Associations and the NCAA in their football rules. Why get them back to play? If you are reading this you probably already have your reason. Usually the athlete wants to return. Parents and coaches are no less invested in the game. Everyone enjoys the benefits of the sport and there is evidence that increased activity is also good for fracture healing. The 11.5-inch size (MEDIUM) and the 14-inch size (LARGE) meet high school and college criteria for play (1/2 in. padding) and should fit most players with or without some modification. The 10-inch size (SMALL) is intended for smaller youth players. It has a 3/8 inch pad due to the size of the competitors and bulkiness of the half inch pad. It was developed in response to the many requests from parents of youth soccer or football players for a smaller size. As with the other sizes, the pad in this one can be cut down to fit nearly everyone. Even this device is 5/8 inch thick with the cover in place. The decision to play must be made carefully. The physician, parent, and player should all participate in the decision process, and understand the reasoning for the decision. REMEMBER: THE CAST PROTECTOR IS TO PROTECT THE OTHER PLAYERS. Everyone concerned ( athletes, parents, doctor, trainer, coach) must understand the benefits and risks involved in resuming play. Usually, a written release from the physician is required for the athlete to return to play. Please show THE CAST PROTECTOR to your physician. 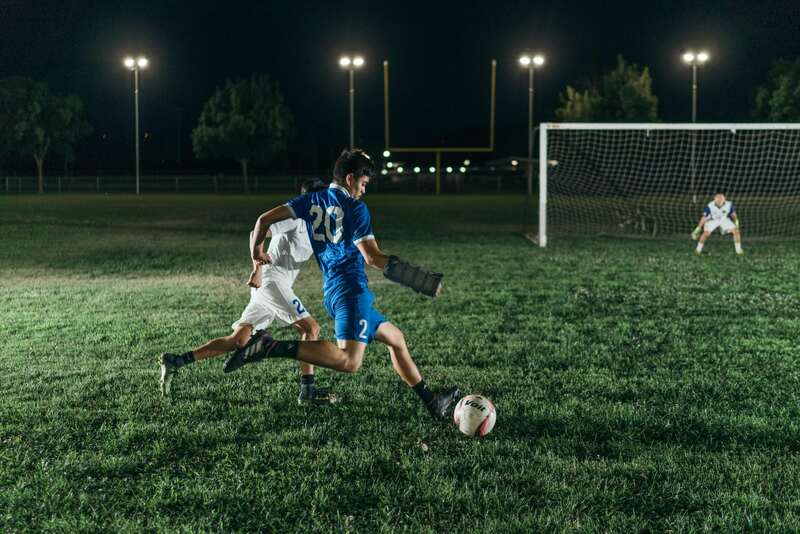 So far THE CAST PROTECTOR has been used in every state and several foreign countries for football (all age groups), soccer, rugby, and hockey. It is also applicable for field hockey and lacrosse. Since it’s introduction, it has also been used for elementary school recesses where required, cheerleading, basketball, baseball and even waterpolo. It can be used to cover casts for broken wrists, hands, and fingers. This would include the distal radius, wrist (carpal bones) metacarpals and phalanges. By far this is the most frequently asked question! All Holiday orders ship the next business day. FEDEX EXPRESS SAVER – gets it to you on the third business day. FedEx does not count the day of shipping. So if you order on Monday it should arrive on Thursday. FEDEX STANDARD OVERNIGHT -gets it there by the next business afternoon. Friday orders a will be delivered on Monday. FEDEX PRIORITY OVERNIGHT- is next business morning( if that service is available to you). Friday orders will be delivered on Monday. FedEx 2 Day -arrives on the second business afternoon. Thursday shipments will be delivered on Monday. USPS (POST OFFICE ) PRIORITY- is 2-3 days ( not guaranteed). They do deliver on Saturday. Is this device approved for use in high schools/NCAA? The two larger sizes have been approved for use in high school football. They also meet NCAA criteria for play with a cast. This letter of approval it can be viewed and copied for presentation at games. This should help gain approval in other sports as well but that is not guaranteed. What does THE CAST PROTECTOR do? 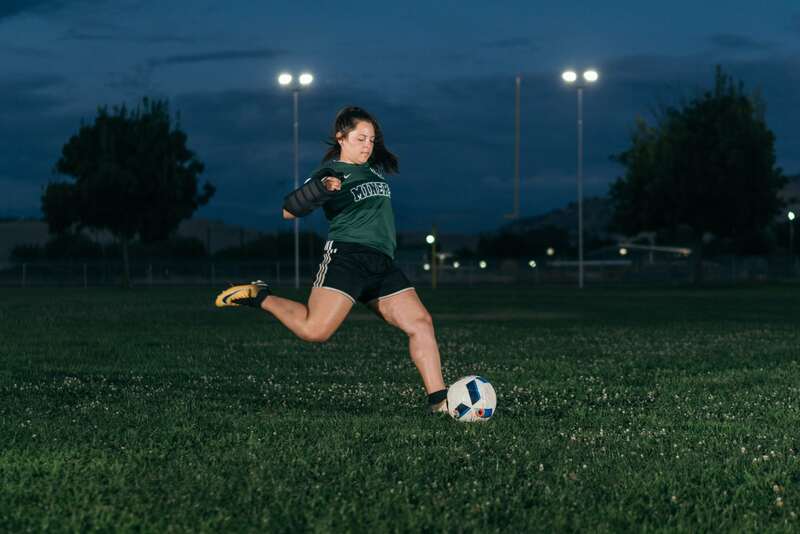 THE CAST PROTECTOR satisfies the rules for playing sports with an arm cast or splint. It is designed primarily to meet the current rules requirements to protect the other sports participants from the hard surface of the cast during competition in a potentially contact sport. It also, to a certain extent, cushions blows on the cast of the wearer. Cast padding is generally required for sports if an arm cast is in place. THE CAST PROTECTOR is a convenient reusable way to pad the cast and meet the padding requirement. In what sports can I use this device? 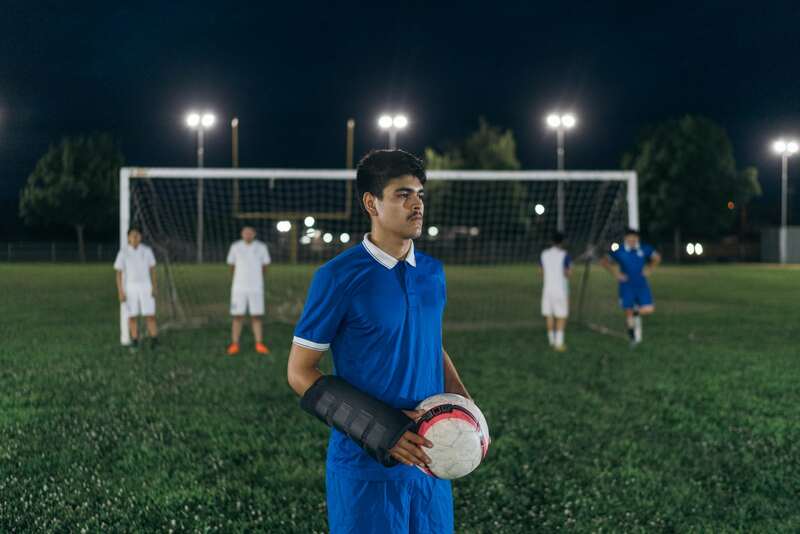 THE CAST PROTECTOR is intended for use for football, soccer, hockey, field hockey or any other sports that allow participation with a padded arm cast. It works with short arm casts for fractures of the distal forearm, wrist, hand or fingers. If the thumb is included in the cast the THUMB PROTECTOR can be added. The THUMB PROTECTOR is not designed to be used alone. Measure the cast from end to end. THE CAST PROTECTOR needs to cover the entire cast. Chose the size which will adequately cover the cast. It is best to measure the cast length and the largest circumference. Remember the pad can be removed from the cover for trimming to the exact size needed. THEREFORE, IF THERE IS A QUESTION, BUYING THE LARGER OF TWO SIZES IS SAFER. The 11.5-inch size fits preteens, women and smaller males. It is 11.5 inches long and 13.5 inches in circumference. The pad can be cut down for smaller children. Keep in mind that the 1/2 inch thickness is used so it will seem bulky on smaller children. The large 14-inch size is based on a 6′ tall 220 lb. male and should fit most larger individuals. It was made with football linemen in mind. It is 14 inches long and 15 inches in circumference. With the THUMB PROTECTOR, one size fits all. Can my child or another child be injured while using this device? Wearing THE CAST PROTECTOR does not guarantee that the wearer or another player will not be injured. It is an attempt to provide the best protection possible to all competitors in a reusable, easy to apply device. There are inherent risks in any sporting activity. Please consider the risks before playing with the device. Will THE CAST PROTECTOR automatically be accepted for game play? 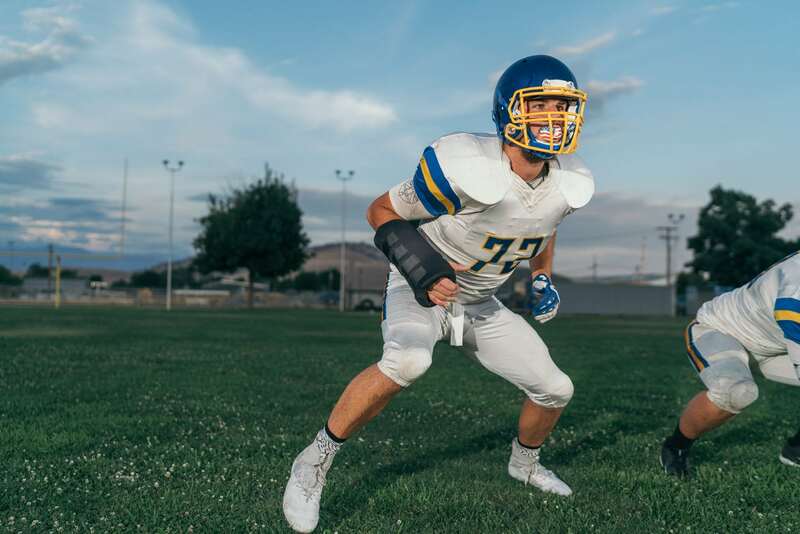 Although the larger two sizes of THE CAST PROTECTOR provide padding that is accepted for high school competition, the official on the field has the ultimate decision to approve this device for use in each game. There is as of now no uniform guide to cast padding across the various levels of sports. The larger two sizes of THE CAST PROTECTOR meet the national high school football guidelines as well as the NCAA guidelines. It should reasonably be accepted by most sports allowing play with a padded cast. I cannot state categorically that all referees will allow it, however. THE NATIONAL FEDERATION OF STATE HIGH SCHOOL FEDERATIONS LETTER OF APPROVAL IS ON THE WEBSITE AND CAN BE COPIED AND TAKEN TO GAMES. The small10 inch size now has 3/8 inch padding. It was designed for the smaller children in response to requests for smaller pads. The pad provides good protection and is much less bulky than the bigger versions on the little players. With the cover, it does measure 5/8 in thick and thus could possibly be accepted at all levels. Remember the pad is designed to protect other players. It is easy to apply, requiring only 4 velcro straps. The inner pad is removable and adjustable for sizing. If the THUMB PROTECTOR is needed, it is applied first and then THE CAST PROTECTOR is added over it, locking it in place. With all devices, the inner padding can be removed, trimmed and replaced. The device fits either side. Is THE CAST PROTECTOR washable? The outer shell can be hand washed in a gentle detergent and air dried. The inner pad can also be hand washed and air dried separately. How does the THUMB PROTECTOR go on? Apply the THUMB PROTECTOR first and fasten the straps to each other. Then place THE CAST PROTECTOR over it. Stretching the cover or enlarging( cutting) the pad hole may be required. The pads in the Thumb Protector can also be removed or cut smaller. Can the size be modified? Yes. Simply remove the pad from the shell and trim it. Then reinsert. If necessary the cover can be folded and taped to fit. We have used sticky-backed velcro to hold the folds. Cohesive bandage known as Co-Flex wrap works well also and does not stick to the device. Is this device available in stores? No. As of now, no sporting goods store has been interested in carrying the device. Please mention the Cast Protector to your local sporting goods store as I would love to sell it locally. What if my cast is long and extends up on to my upper arm?